Georgia’s 6th district is an open House seat. Democrat Jon Ossoff won 48% in an 18-way race, but because he didn’t get more than 50% there will be a runoff between Ossoff and Republican Karen Handel. You’ve heard Handel’s name before. Handel is probably best known—and notorious—for her time at Susan G. Komen for the Cure, which ended after her failed, politically motivated effort to get the organization to cut off funding for Planned Parenthood to perform cancer screenings. With Handel as its vice president, Komen announced that it would no longer fund organizations that were under investigation—and of course, congressional Republicans were “investigating” Planned Parenthood as part of their ongoing political attacks on it. According to a source at the time, Handel was at the center of that decision, and in her resignation letter days later, she said that “I openly acknowledge my role in the matter.” She went on to turn whining into a profession, calling Planned Parenthood a “gigantic bully” for daring to talk to the press about having cancer screening funding cut off for political reasons, and even wrote a book called Planned Bullyhood (because Planned Parenthood is such a bully, don’t you know). Handel is the reason I won’t give to the Komen Foundation ever again, won’t participate in one of their events, won’t buy any of their pink swag. The Komen Foundation is on the wrong side of women’s rights, and Handel was a big part of it. Reason enough for me to contribute a few dollars to the Ossoff campaign. 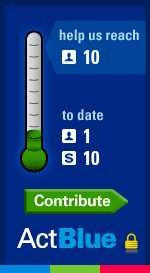 And while you’re in a giving mood, your own county Democratic Party could use a boost as well!